In New Jersey, the process for finding and requesting divorce records depends on the date of the divorce. The New Jersey State Archives maintain divorce records from 1900 and prior, while the Superior Court Public Information Center keeps divorce records from 1901 to 1992. To obtain divorce records from 1992 to the present, you must contact the local courthouse that handled the divorce. For divorce records from any year, you will likely have an easier search if you have case information, such as the spouses' names, divorce date, docket number and location of the local court that handled the divorce. Contact the New Jersey State Archives to inquire about divorce records from a case before the year 1900. Note the spouses' names, divorce date and courthouse location, if you have those pieces of information. The address for the New Jersey State Archives is 225 West State Street-Level 2, P.O. Box 307, Trenton, NJ 08625-0307. You can reach them by phone at 609-292-6260. Contact the Superior Court Public Information Center to search for divorce records dated from 1901 to 1992. Ask the information center about how you can access the Superior Court's index, which will allow you to find the file number and case citation to a local court. The address for the Superior Court Public Information Center is P.O. Box 967, 171 Jersey Street, Trenton, NJ 08625-0967. You can reach them by phone at 609-777-0092 and 609-777-0093. Search for post-1992 divorce records using the "Civil Case Public Access" search tool on the New Jersey Courts website. Enter the first and last names of one of the former spouses and click "Party Inquiry" to search for the relevant case. Review the search results for a case that fits your search criteria based on party names, date and courthouse location. Write down the county and docket number. Contact the local courthouse of the New Jersey county where the divorce case occurred and ask for help to access the county's family division records. You can call the county courthouse directly for records assistance or to get county-specific information. Alternatively, you can submit a written request to the local courthouse by mail if you know the spouses' names, date or year of the divorce and the docket number. However, you should call first to find out the cost of copying and authentication fees, if any. With your written request, you should include a self-addressed, stamped envelope and ask the court to mail the divorce records to you. If you need a copy of a Texas divorce decree, you must request it from the district clerk at the courthouse where the divorce was granted. Typically, you may either make your request in person, by mail or by email. Expect to be asked to complete a form that asks for the date of the divorce, names of both parties and the case number if you know it. Whenever parties are involved in a divorce action, the clerk of court will create a permanent record of every document filed by the attorneys or parties that represented themselves. 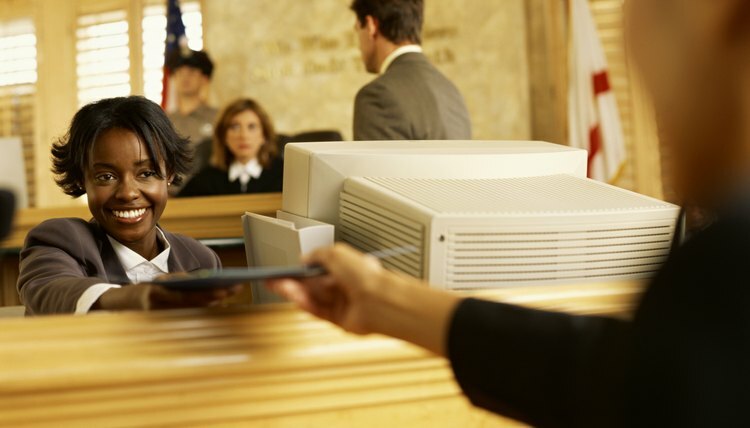 Thanks to the new wave in court technology, most record searches can be conducted online. However, in some instances a request will have to be conducted in person or via mail. Golden State residents looking to legally change a given name or surname have a simple procedure for a new moniker. This process means the name seeker must receive an official decree issued by a branch of the California Superior Court where the person resides. An attorney can help you in completing and filing the necessary documents, but the process is not difficult if you have the time to locate the documents and also the availability to go to the court for the hearing.